Great prices on hotel rooms in the Lakes! Wonderful properties, lovingly cared for. An organization that works hard to protect our heritage. Lake District Guiding is an outdoor activity provider offering quality guided walks, mountain biking, navigation training, wild camping and activity breaks. We offer inspiring, quality outdoor experiences for individuals, groups and families tailored to your experience and ambitions. With an emphasis on enjoying the outdoors with minimum impact, respecting the natural environment and helping to contribute to the conservation of the mountains, we offer a more rewarding approach to outdoor adventure. The company is owned and run by Jason Taylor - a qualified Mountain Leader, Trail Cycle Leader and Navigation course provider - who has over 10 years’ experience as an adventure travel guide leading individuals, groups and families in the UK and throughout the world. In winter he works as a Fell Top Assessor, checking the winter snow and ice conditions on Helvellyn and providing reports for Weatherline on behalf of the Lake District National Park. At the core of all Lake District Guiding activities is an enthusiasm and fascination with nature and the great outdoors. We aim to share this with you and give you the best possible experience by offering the perfect combination of fun, hospitality and adventure in an informative way. And all surrounded by the outstanding scenery of the Lake District. We want to shift the outdoor experience away from bagging summits purely for tick-lists, bragging rights and panoramic photos and encourage clients to enjoy and respect the entire mountain environment. You'll discover there's much more to a day in the mountains than the summits and the footpaths to get there. We intend to help even the most experienced visitor see the area in a new light and make the familiar appear fresh. Lake District Guiding encourages enjoyment of the outdoors with minimal impact, which is easily attained through a few careful considerations. Walking group sizes will never exceed 8, and for mountain biking, wild camping and navigation courses the maximum group size is 6. Over-used areas are avoided where possible and measures are always taken to reduce any detrimental impact on the mountain environment. Read more on the responsible adventure page here. You don't have to own expensive, flashy new equipment to enjoy the outdoors. Nor should you have to conform to the 'rugged outdoorsman' stereotype. Outdoor activities should be accessible regardless of your income or knowledge of the latest technical jargon and the gear that goes with it. Nonsense! Spending time outdoors shouldn't be solely as part of some character building challenge or military style experience, leaving little time to appreciate the superb natural environment. Being outside is great, it's good for you, it's where we belong and it ought to be fun. Enlist the services of an experienced, qualified mountain leader for your mountain walk. We have a programme of regular, guided walks or private guiding for you, your family or group. Whether you need a guide for one of the challenging classics such as Helvellyn or Scafell Pike, or would like access to the local knowledge that adds more to a day in the hills we can help. 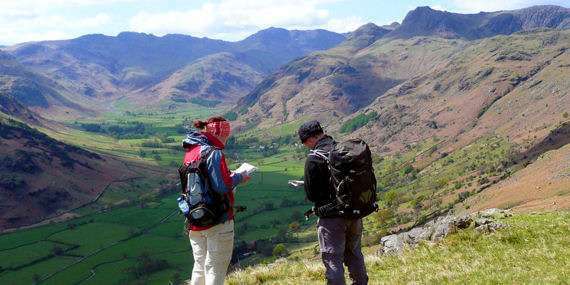 Improve your map reading skills on one of our navigation courses. We offer training and assessment courses for NNAS Bronze and Silver awards or specifically tailored navigation training and courses. If you want to learn the skills that will allow you to get off the beaten track and plan your day out much better, Lake District Guiding will help you on your way to becoming an expert navigator. How about climbing the hills, and then sleeping out in them? Experience a greater connection with the outdoors on a wild camping adventure. We'll introduce you to the art of discreet wild camping with minimum impact so you can blend seamlessly into the scenery and feel part of the great outdoors. Appreciate the stunning mountain scenery of the Lake District on two wheels. If you're a beginner to the activity you may want to learn the essential skills and techniques or perhaps you want to be shown some of the hidden gems on a guided ride. 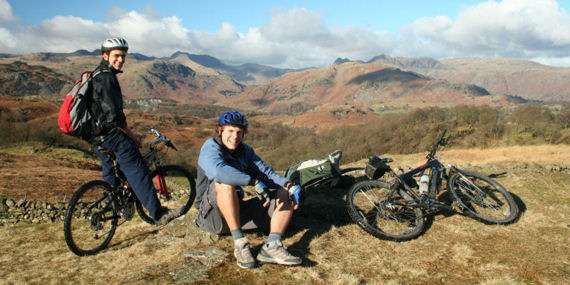 Regular guided cross-country rides in the Lake District are also offered. Small groups, varied terrain and stunning scenery guaranteed. Submit your Lakeland photos to our photo gallery! Lake District walks information here!